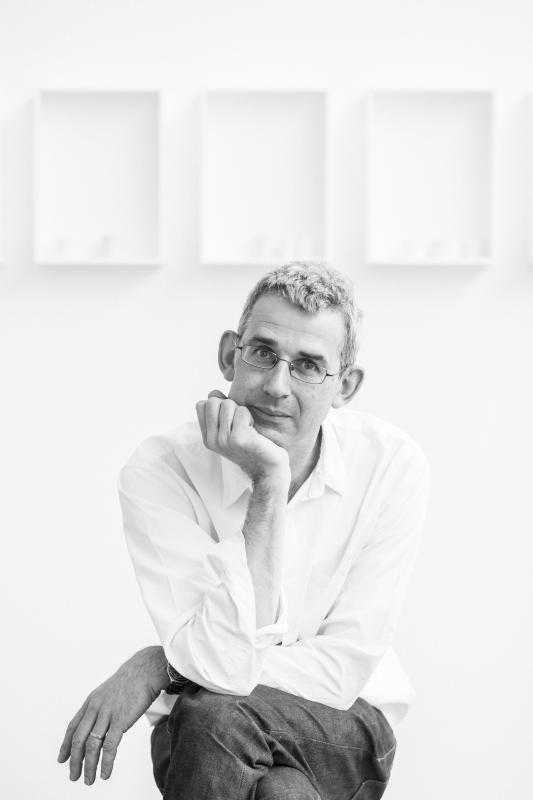 Edmund de Waal is an internationally acclaimed artist and writer, best known for his installations of porcelain vessels housed in minimal structures, often created in response to collections and archives or the history of a particular place. Both his written and artistic practice have broken new ground through their critical engagement with the history and potential of ceramics, as well as with architecture, music, dance and poetry. De Waal continually investigates themes of diaspora, memorial, materiality and the colour white with his interventions and artworks made for diverse historic spaces and museums worldwide. Recent museum projects include —one way or other— at the Schindler House, Los Angeles, an architectural intervention made in response to the Viennese émigré modernist, Rudolf Schindler (2018); white island at the Museu d’Art Contemporani d’Eivissa, Ibiza (2018); Morandi / de Waal, an exhibition with the Italian painter at Artipelag, Stockholm (2017); and during the night, curated on the theme of anxiety from the collections at the Kunsthistoriches Museum in Vienna (2016). An exhibition co-curated with Ai Weiwei, Kneaded Knowledge, was shown both at the National Gallery in Prague and Kunsthaus Graz (2016). De Waal’s fascination with porcelain and white was the focus of a series of exhibitions including white at the Royal Academy of Arts, London (2015); On White at the Fitzwilliam Museum, Cambridge (2013); and Lichtzwang for the Theseus Temple, Vienna (2014). His most recent solo gallery shows include the poems of our climate, at Gagosian San Francisco (2018), ten thousand things at Gagosian Beverly Hills (2016) and Irrkunst at Galerie Max Hetzler with the Walter Benjamin Archive, Berlin (2016). The poetry of Paul Celan is a constant touchstone and most profoundly so for Atemwende, his first solo show with Gagosian in New York (2013). Among his works on permanent display are; the collector (for Paul) (2015) and Signs & Wonders (2009) at the V&A Museum, London; an idea (for the journey) (2013) at the Rijksmuseum, Amsterdam; a local history (2012) at the University of Cambridge; and a sounding line for Chatsworth House, Derbyshire (2007). His first set design featured in the 2017/18 Season at the Royal Opera House for Yugen, a new ballet by choreographer Wayne McGregor, as part of the international celebrations of the Leonard Bernstein centenary. De Waal is also renowned for his family memoir, The Hare with Amber Eyes (2010), which won many literary prizes including the RSL Ondaatje Prize and the Costa Biography Award and has been translated into over 30 languages. In 2016, it was chosen as the Independent Bookshop Week's Book of the Decade. His second book, The White Road was published in 2015. Other books include The Pot Book (2011), 20th Century Ceramics (2003) and de Waal’s critical study on Bernard Leach for Tate (1997). De Waal was made an OBE for his services to art in 2011. In 2015 he was awarded the Windham-Campbell Prize for non-fiction by Yale University. He has received honorary doctorates from the University of the Arts London, Nottingham, Sheffield, York and Canterbury Christ Church universities and is an Honorary Fellow of Trinity Hall, Cambridge. De Waal is on the Advisory Committee for The Royal Mint and is a Trustee for the V&A Museum, the Gilbert Trust and The Saturday Club Trust. He is also a Patron of Paintings in Hospitals. Edmund de Waal was born in 1964 in Nottingham. He lives and works in London.